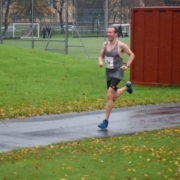 A cool, grey evening in Irvine – ideal conditions for an evening 10k. Part of the Marymass Festival which meant an obligatory pre-race photo for those and the front of the crowd with the ‘Marys’; four local girls wearing red sashes, destined to spend the year promoting good works or be ritually sacrificed at the end of the fortnight, I forget the details. At the start I stayed with the front guys, including Gwyn, for most of the first km before they pulled away, leaving me following Graham McCabe of Kirkintilloch for the rest of the race. I don’t know what it was but this race felt hard right from the very start and at no point was I able to change gears and pick up the pace. A 2km-long stitch made the second half a bit of a slog and uncertainty of where exactly the finish line was meant that I didn’t commit to a fast finish when I should have. Not best pleased with my time. More reps harder reps needed. A well done to Gwyn for a strong finish.